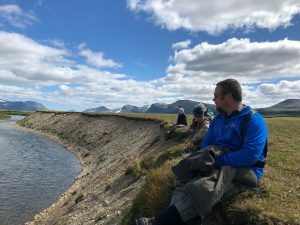 2:00pm rolled around and we still hadn’t spotted one of the famous Alaskan brown bears we had come to Katmai National Park and Preserve to see. 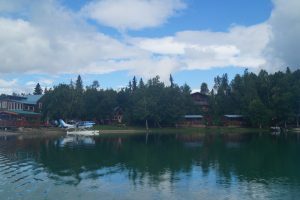 The Farm Lodge on Lake Clark, in Port Alsworth. The incredible runs of pacific salmon—especially the sockeye—up the rivers of Bristol Bay are a big part of what has brought me back repeatedly to this park to learn and write about an ecosystem that is incredibly rich and abundant yet also fragile and threatened. As with many places, the main threats include climate change and the ravages of resource exploitation. In Bristol Bay, the biggest threat of exploitation comes from the proposed Pebble Mine: an open-pit copper mine that, if permitted, would be approximately fifty times the area of the largest current mine in Alaska, with a toxic tailings pond sitting behind the longest and second highest dam in the country. The fact that the landscape is also stunningly beautiful hasn’t hindered my desire to return. It is breathtaking to watch tens of thousands of bright red sockeye pushing upriver in schools so thick that from an airplane it looks as though somebody spilled red dye into the river. It is also good reminder of how complex and interdependent the ecosystems are. The whole northern Pacific ecology revolves around salmon. The oceans and all their creatures are dependent upon the fertile inland waters where the salmon spawn—including numerous headwaters that flow out of the proposed mine location. Matthew (the author), Deborah, Monica, and Jeff on the Cessna Float Plane. And the dependency goes in the opposite direction as well. When the salmon spawn up Alaskan rivers by the millions, they bring into the terrestrial ecosystem nutrients from years of ocean life. They become food for bears, birds, and even berries, as the fish-eating predators carry nutrients for miles out into the woods and onto the tundra. When the ocean habitat suffers, the terrestrial ecosystem suffers also. Joining my wife and me on our excursion to Katmai was our friend Monica Connor, a Castleton State University student and Orwell resident working for the summer at the Farm Lodge in Port Alsworth. 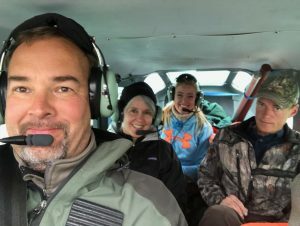 At 9:00am, the three of us climbed onto a little five-seat Cessna float plane piloted by my friend Glen Alsworth Jr., who manages the lodge and air service (for Lake Clark Air) and is the grandson of “Babe” Alsworth, a legendary aviator who some seventy years early helped settle the town that now bears his name. Jeff, one of Glen’s regular guides, joined us. 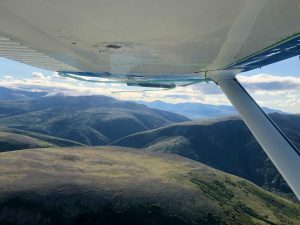 Our flight took us through a range of mountains on the southern edge of Lake Clark National Park, then over Lake Iliamna, the largest lake in Alaska. We looed down on thick lowland forests, treeless mountains, glaciers, snowpacks, and open tundra covered with wild berries and lichen. 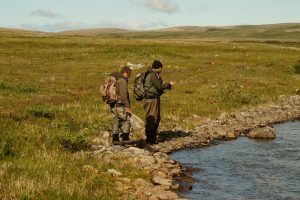 We landed on a small lake in Katmai Preserve near the upper end of a salmon migration up a small tributary to the famous Alagnak River. The sockeye had traveled over ninety miles from the ocean, over waterfalls and past hungry bears, gaining nearly two thousand feet in elevation, to reach this point where they would lay their eggs and die. Watching the bear and salmon from atop the bluff. After Glen and Jeff secured the plane, we headed a mile downriver toward a waterfall where we hoped to spot bears. Glen, Jeff and I had our fly rods in hand. Dozens of sockeye lined the gravel riffs. One of many rainbows feeding on salmon eggs, who was willing to chase an (artificial) egg-sucking leech. 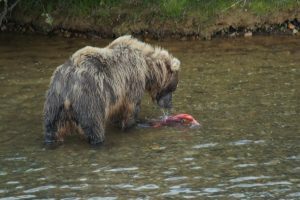 We were not casting for salmon, however, but for rainbow and Dolly Varden trout that had come out of the lakes to feast—like the bears and birds—on salmon eggs and rotting flesh. Though we didn’t spot any trout in the current, we fished our way slowly down. Glen landed one small rainbow. I hooked and landed a three-pound fish. Eventually we reached the falls. Sockeye were thick in the pool below, gathering strength for one final leap and push upstream. But no bears were present. We ate a picnic lunch and hoped bears might appear. They didn’t. We fished another seventy-five yards downstream and spotted several trout swimming behind the sockeye. 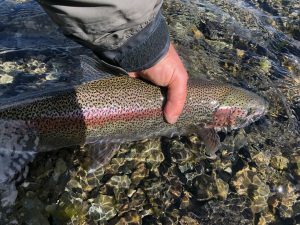 Sight-fishing, I quickly hooked and landed a big rainbow and a fat brightly colored Dolly Varden. 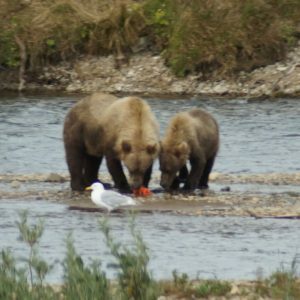 A sow brown shares her salmon with her cub. Still no bears, though. Changing plans, Glen hustled us back to the plane. We flew nine miles downstream to the confluence with another river. With only two hours left in the afternoon, we hustled across a quarter mile of flat tundra to a bluff. And there we spotted our first brown bear—a fluffy brown patch moving along the river several hundred yards downstream. Deborah was just resigning herself to the idea that this distant brown dot might be her only viewing when suddenly Jeff called out excitedly and pointed to the riverside brush just below the bluff where the fat back end of a brown bear hung out over the river. 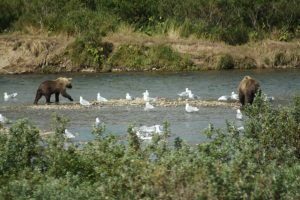 Most of the bears caught their salmon by chasing them across the shallow gravel bars. This big guy just dove into the deep water… and came up successful. Soon, the bear turned around. 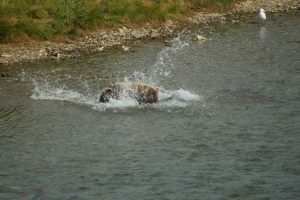 We saw the nose end and then the entire bear as it plunged into the river in pursuit of fish. For the next quarter hour, we watched it meander up the gravel bar. Just about the time this magnificent creature disappeared, a sow and her cub showed up at the same corner and entertained us for another twenty minutes. Momma caught a big salmon in the shallows. Junior watched her eat for a while, then got up his nerve and snatched it away. She let him have it, and set off to catch another. Before we had to walk back to the plane, we were in view of five bears all at the same time, the fourth and biggest of which, spotting a blond back with darker brown legs, wandered down directly below us. Eschewing mad dashes through the shallows, it executed a full body plunge into the deeper water, and managed to emerge fish in mouth. 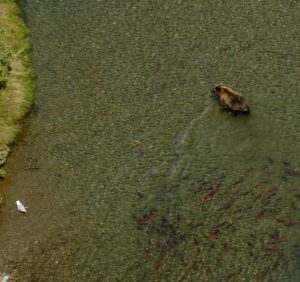 The fifth bear was not in the river, but walking across the tundra at our level. “I think I’ve had my bear fix to last me for a while,” Deborah said. As we made our way back to the plane, carefully keeping another party of fisherman between us and the approaching bear, I thought the same thing.